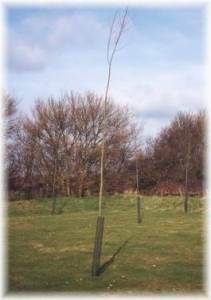 We supply 15 foot unrooted standards trees “English willow sets” for landowners to grow to maturity under contract and a cricket bat making kit for students. From mid November to Early March English Cricket Bat Willow Sets are available with plastic or metal guards. Planted if required. Contact us direct from Contacts Page. – The minimum order quantity is 40 Sets. If you are interest in planting Cricket Bat Willows in a new area, this area would need to be assessed for its suitability. Please contact our offices between March and October so that this can be discussed. The supply of willow each year to new plantations is dependent upon the yeild from our nurseries each winter. Supply of sets is made to sites where trees have been felled, followed by new sites in that priority. All orders must be received by 30th September each year for the current season. Any orders received after the end of September may not be supplied until the following season. However, all late orders will be held on file and any surplus we have over at the end of the season, we will endeavour to supply those clients on a first come first served bases. 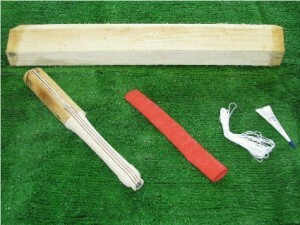 Contains 1 x Grade 3 willow cleft (This is the only Grade available and is Unpressed), Singapore cane handle with binding and rubber grip. (Available 1 per student. Ideal for College courses). This can be supplied to UK Mainland addresses Only. A student pack costs £91.79 including carriage and VAT. Payments to be made by cheque only. Please send your cheque to the office address. Please make sure you send us your full postal address and contact telephone number.